-	Close to all of the must-see attractions in London including Saint Paul��s Cathedral, Shakespeare's Globe Theatre, Millennium Bridge, The Thames and more! This 45 square meter apartment is located on the 1st floor of a secure residential apartment building without an elevator. It is fully furnished with beautiful wood flooring throughout and can comfortably host up to 4 guests. You are sure to feel right at home in this beautiful London vacation rental. The flat has a bright, open-plan living and dining area, furnished with a sofa, coffee table, flat-screen TV with local channels and more. The sofa converts into a comfortable bed for two people in order to accommodate 2 additional guests if necessary and extra linens are included for this bed. There is a table and chairs for four so that you can eat meals in the apartment if you fancy staying in one evening instead of eating in one of the many neighborhood restaurants. . A free Wi-Fi connection is available throughout the apartment. The fully equipped, modern kitchen lies just off the living area. It comes with a stove, oven, dishwasher, refrigerator/freezer, microwave, toaster, coffee machine, teakettle and more. All pots, pans, crockery and utensils are provided so that you can benefit from the luxury of being able to prepare meals at home. There is a clothes washing machine, which will allow you to pack light and save space in your luggage for all of your British souvenirs. A clothes drying rack, iron and board will also be at your disposal. The private bedroom contains a queen-size bed, nightstands, a dresser and plenty of cupboard space to store your belongings. All sheets and linens are provided and you will find the bed neatly made upon arrival. The bathroom is accessible from the hallway and is complete with a combination bathtub/shower, hand sink and toilet. Complementary toilet rolls, shampoos, shower gels and hand soap will be provided to start off your stay. Luxurious bath towels are provided for 4 people as well. A hair dyer is also included so need to pack one. The bedroom also features a small private patio with a table and chairs for you to enjoy. Please note smoking and parties are not permitted on the patio nor in the flat. A member of our Welcoming Team will meet you upon arrival, give you the keys and entry codes, a tour of the apartment and its appliances, help you to connect to the Wi-Fi and more. You’ll find a personal guidebook in the flat with suggestions on where to eat and shop in the Covent Garden area and what to see and do in London. 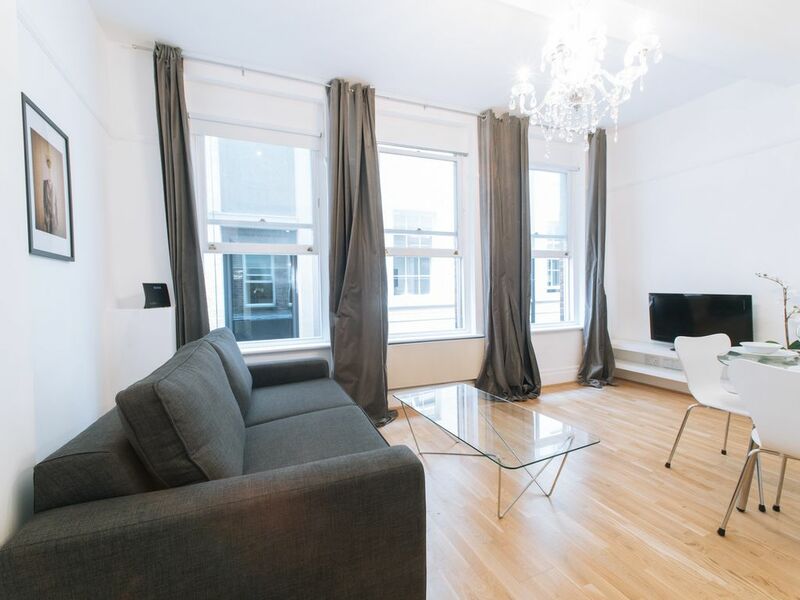 This London vacation rental apartment is situated in heart of the city, close to all of the main attractions. It is the ideal location for those looking to explore London by foot or Tube. The River Thames is just a stone’s throw away where you can stroll along the riverbanks; admire the views from London's famous bridges, including the impressive Millennium footbridge or the famous Tower Bridge. Saint Paul’s Cathedral is located down the road and is a must-see for history lovers. Fleet Street is full of traditional English pubs and home to some of the oldest alehouses in London such as Ye Olde Cheshire Cheese. Head over to Covent Garden to explore its covered markets and grab a bite to eat. The neighbourhood is full of theatres for those looking to see a West End musical, comedy show or other performances. Cross over the Thames to reach the London Eye and take a ride to view London from above. The area is also home to some of London's best restaurants and there’s sure to be something to satisfy everyone’s taste buds. With its close proximity to two London Underground stations, Chancery Lane and Holborn, access to other areas of the city is a piece of cake. You can easily reach sights such as Buckingham Palace, visit Westminster Abbey and Big Ben, have a picnic in Hyde Park or go shopping at Harrods Department Store. The Tube stations also create easy links to reach London’s Heathrow, Gatwick or Luton airports. Hello, my name is Paul and I run a small apartment rental company the heart of London. My team and myself handpick only the most central and luxurious apartments so that we can offer you the best London experience. Whether you are traveling on holiday or for business, with family or with friends, we are sure that you will be impressed with the high standards and choice of exceptional locations in the most exclusive and safe areas of London. It is our pleasure to be able to share our properties of the utmost quality with you while you take in the wonders and hidden treasures of our city. We look forward to welcoming you to our vacation rental in the heart of London. Our philosophy: Our mission is to provide all our guests with an unforgettable stay in London with exceptional service. Services All our properties include amenities and personal services to make you feel comfortable and welcome throughout your stay so that your experience in London will be unique and unforgettable. On arrival, you will be greeted directly in front of the apartment building by a member of our team. They will present to you the apartment, show you how to operate the equipment inside, provide you with information and suggestions about the surrounding area, answer any questions about your stay in general and provide you with apartment keys. Each apartment has free unlimited Wi-Fi Internet access included in the price of stay. We will also provide you with free Wi-Fi codes to use in hotspots all around the city so that you can conveniently remain connected throughout your visit. Our team is at your disposal to answer any questions you may have, you can email or phone us any time during your stay. We look forward to welcoming you in London. This apartment is located in one best areas to stay in London. It is located close to all of the must-see London attractions including but not limited to: Buckingham Palace, Chelsea, Kensington Gardens, The Natural History Museum, The Tower of London and the London Eye. If you are looking for a central and safe place to stay in central London with a family look no further than our apartments! Every apartment: -	is fully equipped with everything you should need (towels, bed linens, hair dryer, free WIFI internet, TV, coffee machine...) -	has been newly renovated for short term rental -	is located close to grocery stores, coffee shops, restaurants, pubs and much more to experience the true Londoner lifestyle. We are sure you will have an excellent stay in London! There is a clothes washing machine and a drying rack is provided for your convenience. Thank you for the nice review, Lara. We are glad you enjoyed the unbeatable location of the apartment and we hope you were able to see all the places you wanted to visit. We hope you'll be in touch for a future visit to London so you may benefit from our discounted rates for our returning guests. Cheers until next time! This property was the first stop on a multi-city journey for my mom and son and everything was great. The host met us, gave great instructions, and the unit is in the heart of the city. I would totally recommend staying here if you have a larger group like I did. Also (bonus) it's right above a nice pub. Really amazing place! Thanks to you and your whole family for being such great guests. We appreciate the kind review and are glad you were able to spend a nice holiday together in London with our apartment. We appreciate you recommending the flat to family and friends and look forward to welcoming you back again soon. Please do be in touch so you can benefit from a special rate for returning guests! Beautiful, clean, quiet and very comfortable. Flat was superb with an amazing location and excellent views, would highly recommend! Thank you for the nice review. We are glad you enjoyed the unbeatable location of the apartment and we hope you were able to see all the places you wanted to visit. We hope you'll be in touch for a future visit to London or Paris so you may benefit from our discounted rates for our returning guests. Cheers until next time! Location, was easy to find, check in and out was hassle free and they helped us with nearby parking. We are glad that the apartment met your expectations and that you enjoyed the great location and amenities. It was a pleasure to welcome you and we look forward to having you back in the future. You will benefit from a discounted rate on your next stay when you book with us. Cheers! great location and amenities. It was a pleasure to welcome you and we look forward to having you back in the future. You will benefit from a discounted rate on your next stay when you book with us. Cheers! Your review is too kind and much appreciated. We are glad you and your family enjoyed the extremely central location of our flat. It is always a pleasure to host guests like yourselves and hope you'll reach out for your next visit so we may give you a special rate for returning guests. Cheers!